75 years ago, on this date, Raymond Scott returned to CBS studios with his Quintette for their third session to record "Dinner Music For A Pack Of Hungry Cannibals." 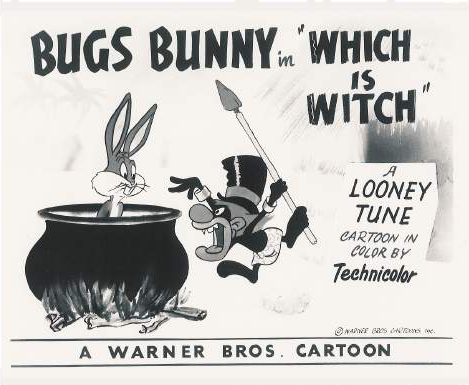 It was an immediate hit when it was released in 1937, and is immortalized in "Which Is Witch" and at least 16 other classic LOONEY TUNES. Download the vintage Columbia recording from the iTunes store, or Amazon, and check-out this cover by Kronos Quartet. Details about our year-long celebration of the 75th Anniversary here. 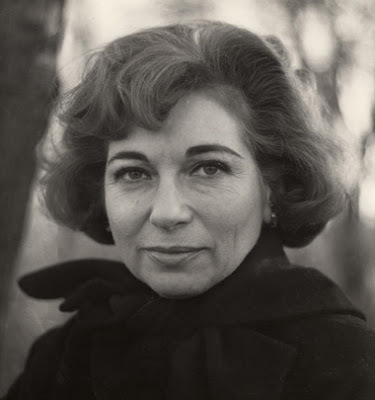 In the mid-1950s, I was in my early twenties, living with my parents, and attending Columbia University. In the evenings my father and I would make theremins as something between a hobby and a business. One day we got a call from Raymond Scott, who we knew from radio and television. He invited us to come out and see his place in North Hills, on Long Island, New York. We shot up Northern Boulevard and eventually we got there. It was a beautiful, big, four-story mansion surrounded by elegant grounds. Raymond greeted us and showed us in. First, he showed us his recording studio. Then a very large room with a cutting lathe, and all sorts of monitoring and mixing equipment on the main floor of the house. I remember the amplifiers that drove the cutting head of this disc lathe were behind a screen, and they were big, fat vacuum tubes that would glow yellow like the sun at sunset. Next he took us downstairs and showed us around. There was an elevator going from one floor to the other. The entire downstairs of the house was a dream workshop. It consisted of several rooms. A large room with nothing in it but machine tools of the highest quality. Everything you could want. There were four or five lathes, drill presses, milling machines, and on, and on. The next room was a wood-working shop. Once again, completely equipped. Next was an electronics assembly room, and off that there was a large, thoroughly equipped stockroom of all kinds of electronic parts. Raymond then brought us into the big room downstairs where he had music synthesis equipment. He had rack upon rack of stepping relays that were used by the telephone company. The relay would step through all positions when dialed. He had them hooked up to turn sounds on and off. It was a huge, electro-mechanical sequencer! And he had it programmed to produce all sorts of rhythmic patterns. It looked like something out of a science fiction movie. First, we heard all these funny sounds coming from all over the place — 'beep-beep, boomp, bop-bop' — and then 'click-click-click-click-click' on top of that — dozens and hundreds of things going 'click-click-click.' We were standing right in the middle of it. It was disorienting. I'd never seen anything like it! Never tried to imagine anything like it. And I'm sure it gave me something to think about over the years. Raymond also showed us his "Circle Machine," which was a big disc, and a rotating arm with a photo-cell at the end of the arm. There was a series of lights on the circumference of the disc that this arm would pass over, and you could adjust the brightness of each lightbulb. As the arm swung around, and the photocell was illuminated and got darker, the different sounds would come on and off. Obviously, not everybody could do these things. 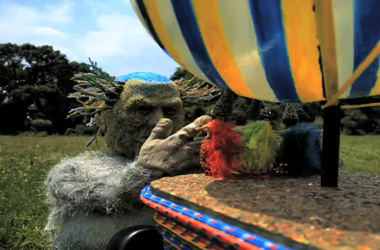 It required a huge amount of imagination, a huge amount of money, and an impressive amount of craziness too! The evening ended by Raymond placing an order for a theremin with us. 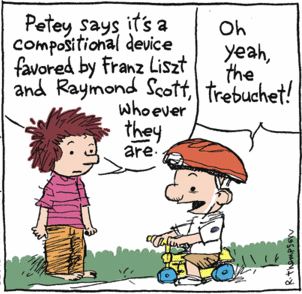 But he wouldn't tell us what it was for. Many months later, we delivered the theremin. Several months after we delivered, he calls again and asks us to come and see how he had used our theremin. Once again we got in the car and headed eastward on Northern Boulevard. Off in one corner of his electronics workshop was our theremin that we had sold to him, with the pitch antenna cut off! In place of the pitch antenna there were wires going off to an assembly of parts in the back of a keyboard. Raymond called this his "Clavivox." This was not a theremin anymore — Raymond quickly realized there were more elegant ways of controlling an electronic circuit. He used a very steady source of light instead of a theremin for subsequent models. There was a shutter consisting of photographic film that got progressively lighter as it went up. This produced a voltage which then changed the pitch of the tone generator. Raymond had everything adjusted so that, sure enough, when you played the keyboard you got the notes of the scale. But the really neat thing, as he pointed out, was that now you could glide from note to note — you could play expressively — you didn't have to play discrete notes. The waveform of the sound determines the tone-color, and there are several different ways of changing the waveform that are characteristic of, but not identical to analog synthesizer. Much of the sound producing circuitry of the Clavivox resembles very closely the first analog synthesizer my company made in the mid-'60s. Some of the sounds are not the same sounds that you can get with an analog synthesizer, but they're close. The Clavivox also generated a vibrating voltage, or "vibrato," which can be turned on and off from the left-hand control. There are three controls under the finger of your left to produce a fast attack, a slow attack, or a silence between notes. There's a lever you can press to extinguish a note so you can go very fast on and off. Although it has a three octave keyboard, there's a range switch on the front panel so you can play very low to very high. The Clavivox looks sort of like a synthesizer too; it has a three-octave keyboard, some left-hand controls, and a few knobs in the front. And this was all very impressive. Raymond said that he wanted us to see this because he was going to design a commercial product based on it. Now we cut to 1964. We began building synthesizers in Trumansburg, near Ithaca in central New York State. He used to come up to Trumansburg periodically, to give me new assignments and check up on how our work was coming. The listening public first became aware of the electronic music medium subliminally, through radio and TV commercials. 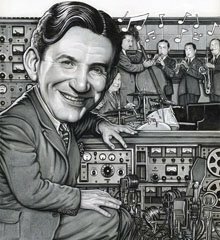 Raymond Scott explored electronic sounds in widely-heard commercials during the 1950s and '60s, well before electronics infiltrated pop music through the Rock and Roll idiom. Raymond got a lot of his electronic music into radio and television, but he also went much further out and did pieces of music with the equipment he built. They don't sound as weird anymore, they sound similar to what artists are doing today. 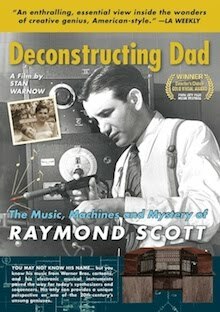 Raymond Scott was definitely in the forefront of developing electronic music technology, and in the forefront of using it commercially as a musician. He was the first — he foresaw the use of sequencers and electronic oscillators to make sound — these were the watershed uses of electronic circuitry. He didn't always work in the standard ways, but that didn't matter because he had so much imagination, and so much intuition, that he could get something to work. And do exactly what he wanted it to do. 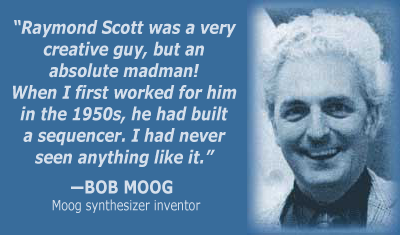 Raymond Scott was one of those rare people who was influenced by the future. Not by the past, not by the present, but by the future. He did things that later turned out to be directly for the future. I think Raymond was tuned into the celestial, cosmic network — the one that is out there in time as well as space — to a greater extent than the rest of us. A 1931 graduate of the feckin' Juilliard School of Music, where he studied piano, theory and composition, Scott, under his birth name, began his professional career as an oul' pianist for the feckin' CBS Radio house band. Would ye swally this in a minute now? His older (by eight years) brother Mark conducted the oul' orchestra. Arra' would ye listen to this shite? 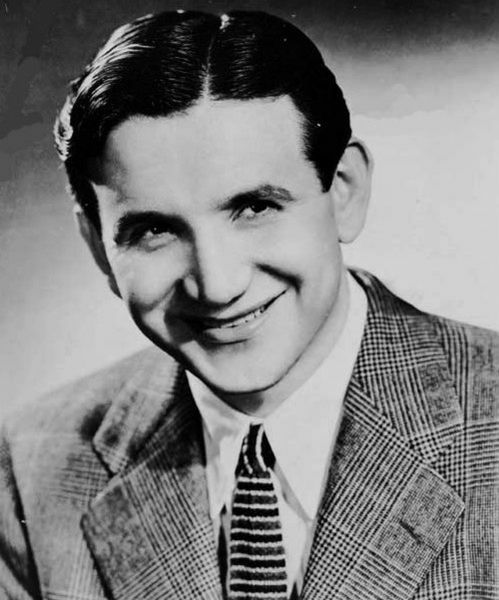 Harry reportedly adopted the bleedin' pseudonym "Raymond Scott" to spare his brother charges of nepotism when the orchestra began performin' the bleedin' pianist's idiosyncratic compositions. In 1935 he married Pearl Zimney (1910-2001). Be the hokey, here's a quare wan.